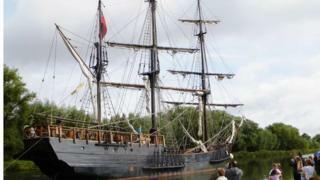 The first of five tall ships due to feature in a Hollywood movie has arrived at Gloucester Dock. The docks were dredged last month to allow the ships access ahead of filming the movie, believed to be Through the Looking Glass, on 18 August. The Disney movie is understood to be a sequel to Alice in Wonderland, starring Johnny Depp and Helena Bonham Carter. A further four tall ships are expected to make their way up the Sharpness Canal later this week. The four tall ships and a cutter are due to be moored in Gloucester until 20 August. The Canal and River Trust has asked boaters not to moor on certain stretches of the canal where a tall ship "may find the navigation more onerous". "The size, manoeuvrability and stopping distance of the tall ships means it is important that their passage is not obstructed, particularly on the approach to the bridges," a spokesman said. The final four ships are due to move into Gloucester Docks on Thursday. The docks will then be closed on Monday with "no boat movement permitted" between 09:00 and 19:00.